I will never forget the day I got my first cellphone. In hindsight if cellphones didn't come onto the market for another 10 years I would have saved my parents thousands of dollars in the amount of cellphones I have either lost or broke. Anyhow, I digress because this cellphone wasn't just any stinkin' cellphone. It was the bomb. I had the old school Nokia with the supped up antenna. What up now? And I had a cover that was shiny and blue so my phone was pimped out. But the best part of the phone by far (minus all of my 9 contacts) was snake. 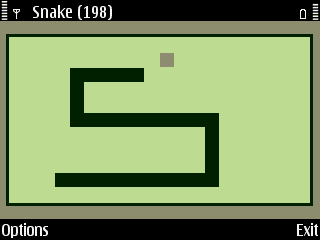 Snake was the best cellphone game to this day I will say it proudly. Brickbreaker doesn't stand a change in competing with the awesomeness level of snake. Something about chasing a small black dot around with a growing black line that grows and grows as you eat the dots was thrilling. Not to mention addicting, once you started a game of snake, you were zonked out for at least spans of fifteen minutes. Almost the equivalent of today's Angry Birds. This first cellphone changed the course of teenage life as we know it. It was immediately followed by camera cellphones and look at how far we have come today. But, remember an ode to that old school Nokia!!!! 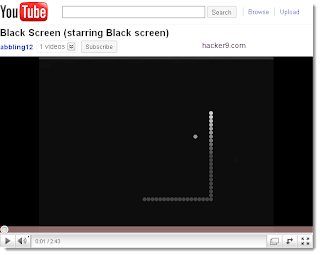 Image is a screenshot from a Mac on a Black Screen YouTube video. 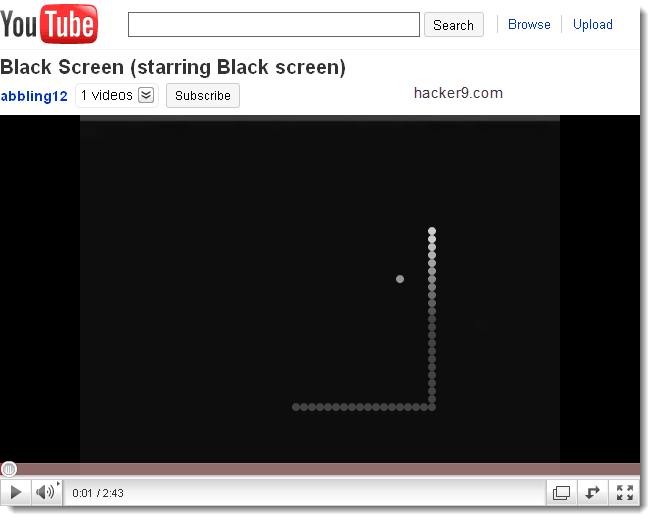 Props to myself for showing you how to play snake on any YouTube video #winning. That snake trick is pretty much the coolest thing ever. The cat's MEOW. That YouTube trick is bewildering. Holla at some $nake. I remember when I first got my first cellphone and it was a Nokia 5110. You just made me remember it, especially about the Snake part. I was always playing it just to kill some time. Oh the memories.